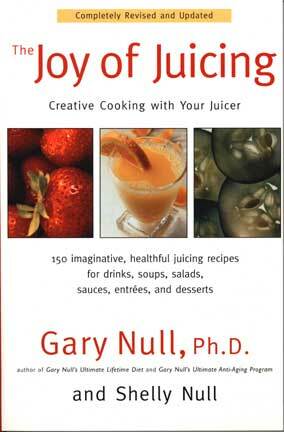 The Joy of Juicing: Creative Cooking with Your Juicer - 150 imaginative, healthful juicing recipes for drinks, soups, salads, sauces, entrees, and desserts. Gary Null is widely recognized as one of America's foremost experts on health and nutrition. His fitness plans, outlined in his numerous bestselling books and on the popular Gary Null Show, have helped millions transform their bodies and attain health and well-being. Juicing has always played a prominent role in Gary Null's fitness programs. In this completely revised and updated edition of The Joy of Juicing, you will learn how to use your juicer to transform hundreds of fruits and vegetables into savory snacks and meals--from drinks that can improve your vision or boost your energy, to sauces, dips, and entrees that are as healthful as they are delicious. All of them have been kitchen-tested by the author and his daughter Shelly, an accomplished chef. A diet rich in fruits and vegetables has long been recommended by nutritionists, and new research indicates that the phytochemicals present in many vegetables may help prevent cancer, heart disease, arthritis, and a host of other diseases. Juicing is a terrific way to incorporate these foods into your diet. With more than one hundred simple, satisfying recipes, The Joy of Juicing allows you to do just that, creatively. Juicing is a crucial part of Gary Null's fitness program, and an easy way to reap the benefits of healthy eating. 230 pages. Note: Prices are subject to change. We are not responsible to honor advertised prices that are the result of typos or mistakes in data entry. If an order is placed for items with these types of mistakes, we will notify the customer and cancel the order. If you were pleased with our service, please put your comments here Thanks! $5,000.01 and up = FREE SHIPPING! Return Policy: We will replace your item if it is damaged in shipment or is factory-defective. All other returns are subject to a 20% restocking fee and returned at buyer's expense. If you wish to return or replace an item we must be notified within 10 days. DO NOT send the item anywhere without calling us (626-915-0888) or emailing us (sales@bearsinthewoods.net). We need to be notified first before we can replace an item or refund any money.